Tigris and Euphrates (Euphrates River) outline the social, cultural, historical and general life outlook of many Asian nations. In the past, and today, parts of the two rivers were the main source of livelihood and irrigation in the region of ancient Mesopotamia. Today evidence of their huge importance comes from the abundance of priceless archaeological evidence, telling of the rise and fall of civilization, extending from Turkey to Iraq. Euphrates is in West Asia. This historic, even biblical river rises in the territory of Turkey from the Caucasus, leaving through Syria and Iraq, and along with the Tigris River forms the Great Arab River (Shatt-el-Arab/Shatt al-Arab), which flows into the Gulf, by its delta. These are the lands, known as Mesopotamia, which are considered part of the so-called. Fertile Crescent. Euphrates River runs for 2, 800 kilometers and 94% of its waters originates in the Turkish mountains. It runs in a southeasterly direction, and in Central Turkey, the Euphrates River is joined by Murat Korasuyu and several others. Khabur joins the Euphrates in eastern Syria. Euphrates is the most watered in summer, when mountain snows melt. Experts say the Euphrates joins the Tigris in a place called Cournot, and thus giving rise to the river Shatt-el-Arab in eastern Iraq. Several kilometers downstream from the junction of the two major rivers, Shatt-el-Arab gets another influx from the northeast - Kerha. Her bed is more than five hundred miles. In the Shatt-el-Arab, now also joins another large river, Kura, who once flowed through another bed, and was flowing directly into the Gulf. The name of the Euphrates probably derives from the Arcadian, purato, which means wide. Scripture in many places named Euphrates as just "river" or "big river" and it defines the eastern border of the land that God promised the Jews. Euphrates River is fundamental in Biblical geography because it has often served as the Far Eastern limit on the land of Israel. Under the reign of Pharaohs, Egypt extends to the west coast of the Euphrates. Euphrates River flows through many towns. It has a broad course, but not deep, which prevents navigation on it. The most convenient mode of transport on the Euphrates are small boats or boats. In Basra, the river is divided into marshy land around the city. In the upper river, in the territory of Turkey, are constructed cascade extraction facilities for electricity, and regulation of river flow. 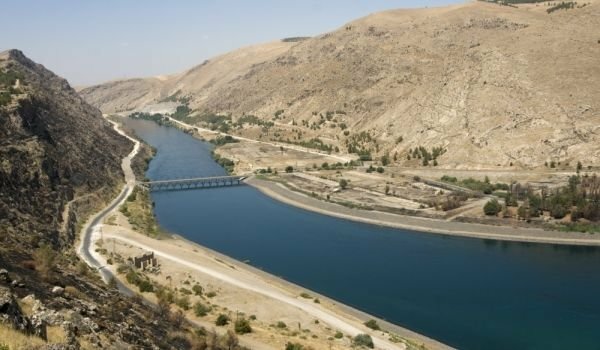 This leads to some diplomatic tensions between Turkey on one hand, and Syria and Iraq on the other hand, because Syria and Iraq rely on a steady flow for agriculture and hydropower, campaigns by the Turkish side cause significant damage to agriculture along the Euphrates.